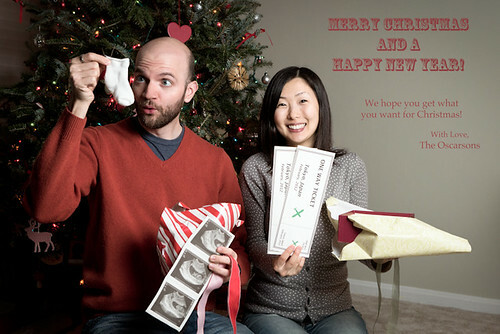 Oscarson Photography: Merry Christmas and a very exciting 2012! Merry Christmas and a very exciting 2012! Without further ado, Merry Christmas! There are three parts to this card. Some of the people who look at this blog already received the actual card in the mail, but for those of you who have not... this should be fun. I'l be back to explain... later. I hope you are where you want to be doing what you feel you want to be doing for this wonderful holiday! Thank you all for making this year so wonderful for us. 2012 promises to be an exciting year! since the riblet got us up early, i'll be the first to comment on the blog: we'll miss you but are so super excited for this next big step in your lives. save us a bowl of tasty ramen at your table for when we come to visit. sarah stole my comment. i better find a whole lot of money so i can come visit little baby spo!